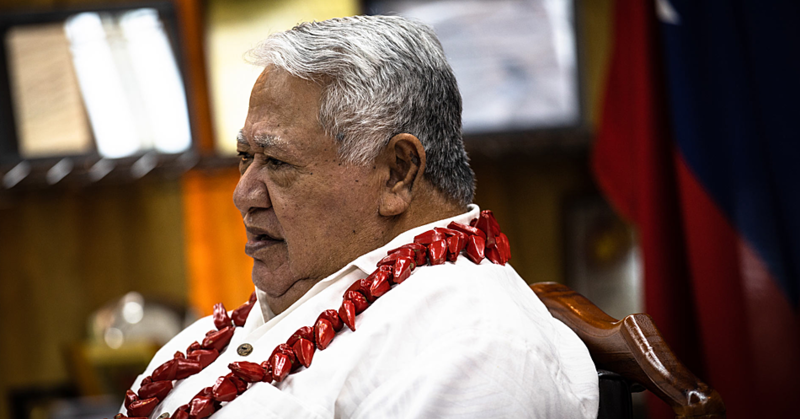 The former Head of State, His Highness Tui Atua Tupua Tamasese Efi, will break his long held silence over fears about the alienation of customary lands today. He will do this during a press conference at his Tuaefu residence where he will deliver a paper on the issue. The press conference was confirmed in a letter from his Office earlier this week. “As announced in the Samoa Observer on Wednesday the 11th April 2018, Le Afioga a le Tama-a-aiga, His Highness Tui Atua Tupua Tamasese Ta’isi Tupuola Tufuga Efi invites media personnel to attend a media event at the Ta’isi residence where he will be speaking to the customary land issue,” the invitation reads. The reference to the announcement on the Samoa Observer was in relation to a letter to the editor the former Head of State had written. It was in response to a call from one “Faapale Taumua” who challenged the former Head of State and called for his voice on the issue of customary land. “First and foremost, I humbly and respectfully apologize for my presumption to approach your Highness without invitation,” Taumua wrote. “I am confident though that the former Prime Minister that I remember as a youth, a humble man full of wisdom, will welcome any and all contributions to the conversation on all subject matters irrespective of rank or title, involving welfare of nation. “The subject matter addressed here, the circumstances and the long term detrimental impact of L.T.R.A. of 2008 to community, warrants temporary suspension of decorum so as to enable community to voice opinions on matters that will directly affect us all. But the letter touched His Highness Tui Atua quite deeply. “Talofa Faapale Taumua,” he wrote in response. “I write in response to your open letter in the Observer 10 April 2018 which moved me to tears and prayer: Dear God, make me worthy of this man’s trust. That place is Tui Atua’s residence at Tuaefu today at 10.30am. First and foremost, I humbly and respectfully apologize for my presumption to approach your Highness without invitation. I am confident though that the former Prime Minister that I remember as a youth, a humble man full of wisdom, will welcome any and all contributions to the conversation on all subject matters irrespective of rank or title, involving welfare of nation. The subject matter addressed here, the circumstances and the long term detrimental impact of L.T.R.A. of 2008 to community, warrants temporary suspension of decorum so as to enable community to voice opinions on matters that will directly affect us all. I pray that if this call reaches you, that the subject matter be your foremost concern and not the source. And I again apologize for my presumption and any inconvenience I may cause for calling on you for assistance. I have the urge to present this point to check if it crossed your mind. It had been discussed and voiced in the past but we are now on that cross road demanding direction from our leaders. Being that you are the Tui Atua, you are the Father and Leader of the nation based on the Aganuu, the Faa-Samoa. Therefore, on behalf of all those concerned with the long-term impact of the L.T.R.A. 2008, I hereby seek your opinion regarding questions raised below. The opposing voices about L.T.R.A 2008, focus more about the risk the Prime Minister is exposing our lands to. I have reviewed due process procedures only under Part 2, drafted up for the protections of families and their lands, and what I find are word-playing tricks drafted by lawyers that I prefer to believe, the Prime Minister himself understands. Our elders may not be so educated in these kinds of governing processes with laws written out in complicated technical jargons and their meanings, but that does not excuse anyone to treat them as fools. The tricks written into this Part 2 alone reveals how the government views our community as a whole. Being simple in matters of the outside world does not mean they’re idiots. It is my general understanding that you signed off on this law. This is perhaps why you are so far reluctant to come out publically to join the protests. I don’t blame you. This is because one of the strengths of our culture, is the unquestioning trust we place on family and community leaders that they will do their utmost to protect us from harm. But in the hands of irresponsible individuals and leaders, this unquestioning trust can turn into a double-edged sword. You did the same here. You trusted that the Prime Minister will not intentionally harm the community and signed off without reading it thoroughly. But if you regret it now, then you also regret the Faa-Samoa that raised you and made you the man that you are today. You trusted a leader like you were supposed to. It is an automated reaction as the culture demands of us all even today. All of us would have done the same. But as Abraham Lincoln once said, “I walk slowly, but I never walk backward”. Walking slowly in this case, works out for the best. This is because this law, presents a scenario that had been avoided but must be dealt with eventually. If you hadn’t signed it, we would not have had the chance to deal with this issue to its final conclusion. But as least for now, we have you, the best of all of us to deal with it. I have a separate concern besides the danger the L.T.R.A. of 2008 poses on our customary lands. My concern is about maintaining the rule of law as established by the Aganuu Faa-Samoa for thousands of years. We generally view the Faa-Samoa as a culture, but what we overlook is the fact that the Faa-Samoa also had the authority to make rules, established traditions that became accepted practices, which became laws that regulated our social lives. This authority to make rules and regulations means that the Aganuu Faa-Samoa, falls under the category of government consistent with its modern definition. It was the Faa-Samoa that established a regulation and rule of how a family land shall be owned. There had been other rules and regulations as well that we continue to apply today that are critical in maintaining and strengthening our culture, identity, and continue to promote harmony amongst community members. Another example of this is that families are left to choose their Matais on their own without government interference. The rankings of Matai Titles also are left to standards set by our ancestors undisturbed as another example. These were rules and regulations and as they were established by the Aganuu Faa-Samoa, we must consider the Faa-Samoa as a governing body equal to all forms of modern governments as defined, because of its authority to make rules and regulations for community to live by. Because of how ancient our regulation is regarding land ownership, some Judicial Systems like the American’s, will definitely view this regulation as a law that granted all citizens a fundamental right or fundamental liberty, to be a part owner of family land, equal to all members of family. In America, there are not that many rights or liberties considered fundamental. I believe you understand this point very clearly. These fundamental rights include the right to worship any god of your choosing, the right to associate with anyone, the right to raise your child as a parent, and the right to choose your spouse. These fall under the umbrella of natural rights of man to Life, Liberty and Pursuit of Happiness. This is because these rights were practiced by humans individually all over the world, before men began organizing communities to form modern governing bodies to govern their lives. Some were added onto this list by the American Constitution however. The American Courts have guarded these rights zealously and will carefully review any government interests seeking to interfere with, or deny the exercise of these fundamental rights and liberties. This generally means that to interfere or deny these rights, government must prove that there are no other alternatives left to them in pursuit of their goals, but to interfere and deny the exercise of these rights and liberties outright. Because of how ancient our rule and regulation is as to land ownership, we can claim following the American system that each of our family members has a fundamental right or liberty to land ownership equal to all other members. In that case, under American law, the question the Court asks in a challenge against a government policy that seeks to interfere with, or deny exercise of right is: how compelling is the government interest that now seeks to eliminate this right completely, a right so ancient that it might had been the very first right established by our ancestors? The government interest that justified the LTRA of 2008 is to make money. How compelling is this interest when there are plenty of other alternatives available that will accomplish same goal, but leave this ancient right undisturbed? My opinion is that the authority that must deal with this question and other related ones is the office responsible for maintaining and prolonging the Aganuu Faa-Samoa. This office is the office of the Tui Atua. 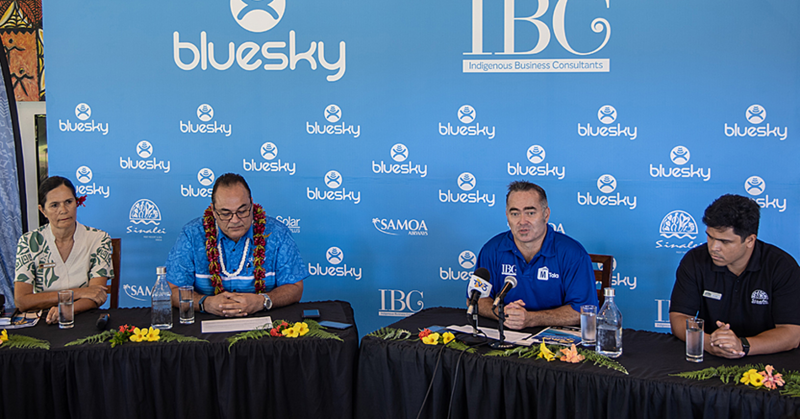 This is because the fundamental right interfered with and deleted by the LTRA, was a fundamental right granted to us all by a governing body that is still operating today, the Aganuu Faa-Samoa. My first question is: does the government have authority to overrule any rule or regulation set in place by the Aganuu Faa-Samoa? Out of respect for our elders, your peers and subjects of the Tui Atua, I believe this question needs to be presented for their overall opinions. They all have a right in deciding this question. I kind of remember a question of this kind, that of separation of the powers between the Aganuu Faa-Samoa and government floating around during your term as a Member of Parliament in the 70s, but not of the circumstances that brought it up. I remember it not only because my father (who looked up to you (he wished he was educated as you)) had an opinion of it, but also because it was unique. But here it is again confronting us except that this time, the government is now seeking to pull out the corner stone of the foundation that the Aganuu Faa-Samoa is based on. This is a huge structural change to our way of life. This rule had been set in place so far back that the memory of its beginning is lost to us all. It must had been very important to our ancestors to set this up in place. Whatever their purposes were, it brought harmony to the community and implanted on all of us a sense of belonging. This is the psychological element that the Prime Minister does not see. The land came first before man and therefore acted as the cornerstone which began the roots of the culture that came to be known as the Faa-Samoa. The next question is this: If someone is to pull out this cornerstone, is that someone a Tuilaepa, or under the authority of other Titles he represents? And if it is, then why is he worthy of a monumental structural change that will forever change the core of the Aganuu Faa-Samoa? In other words, what had any of these Matai titles he represents done to deserve this honor? My answer is no. This is not to demean the honor of these families, but it is because I believe that nobody alive has earned that right. Can you imagine a vision so far ahead of its time in both social and psychological impact that went into shaping this rule for our community? I don’t believe schools or universities were invented yet then? And yet, our ancestors devised this scheme so beautiful that it seems like it was passed directly from God. And yet, minds framed by so called advanced education fail to see the advantages that such wisdom contributed to our identity. So who is worthy then? The L.T.R.A. of 2008 has brought this confrontation head on. To support what the government is seeking here, is a vote granting the government authority from this point forward of regulating all areas pertaining to our social lives that were once regulated by the Aganuu Faa-Samoa. The government may seek to tell you who the Matai of your family shall be and as precedent is already set here, you may have to accept that too. 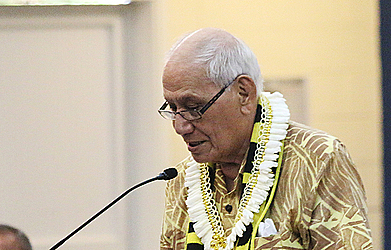 As of now, there is no one speaking up to represent the Aganuu Faa-Samoa and its interests. The only worthy representative is one with the Tui Atua honor. So this issue falls on your lap unfortunately. But as difficult as may be, you are worthy of the task. But that is speaking from a biased point of view. I was a boy of around ten years old when my father and I began sitting around our little radio mesmerized by your voice, wisdom and delivery as a Member of Parliament. It was the only time that I noticed my father had stopped working. But I believe it was the same with most of our country at that time. Everything kind of stopped when Tupuola Efi spoke. That kind of manna had not been seen since. I then discovered a speech you gave the United Nations sometimes in the late 70s or early eighties rejecting South Africa’s apartheid policy. I had goose bumps and tears as I remembered those early days with my father as I was reading this. But even more so was the knowledge that my father wished for while listening to you that was spelled out in details on this speech. Like the ancestors who drew up this plan for the distribution of our lands, you were ahead of the times. These so called advanced societies with education degrees to prove their worth, had no idea of what freedom to individual liberty was, but our Tupuola Efi did. I was so proud. I am calling for that hero today who understood and defended individual freedom to liberty. We need the Tui Atua’s wisdom in deciding whether a government formed by ideas of outsiders, has the authority to change rules and regulations set up by our ancestors under the Aganuu Faa-Samoa? There is nobody worthy amongst us to lead the discussion. It may seem like this law only deals with land ownership, but it is not. There are unforeseen consequences of this change that has opened up the nation to another form of foreign invaders. You will leave behind a broken foundation that will never be repaired. This is the beginning of the end of the Aganuu Faa-Samoa as we know it as this structural change will slowly divide the nation into classes of landowners and serfs. A knowledgeable man like yourself fully understands how this kind of system worked out for minorities all over the world! The Faa-Samoa is the only thing that separates us from other cultures and responsible for our national identity. If we let the government delete one fundamental right and liberty for such minimal justification as to make money, where will it end? Can you envision a Chinese Tupua Tamasese when future government decides to fix budget shortfalls by selling our Matai names to the highest bidder? I trust in your leadership as if anyone understands the nature of fundamental rights and liberties and what they pertain, it is you my Tui Atua. This is your watch.